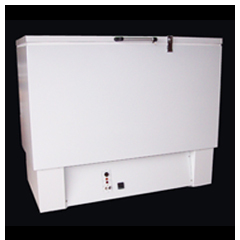 The 40-12 industrial freezer is a ruggedly built chest freezer which can operate from 0°C to -40°C. It features an all-steel construction, inside and out with key-lockable lid, digital temperature controller, a/v alarm system, casters for easy mobility and cfc-free refrigerants. For use in laboratory or industrial applications where performance and quality count. Welded steel, zinc coated, inner and outer cabinets with epoxy enamel finish on inner cabinet and enamel textured finish on outer cabinet. Counter-balanced with magnetic gasket, chrome plated handle with cylinder key-lock and sub lids.